I make no secret about the fact that fall is my absolute favorite season. Between the pumpkin-spiced treats, falling leaves, warm-toned landscape, and endless fall activities, I simply can’t get enough of the many opportunities that fall brings. Fall also happens to be my favorite season for horticultural therapy. This exciting time of year is when all the off-site therapy gardens are reaping the benefits from their summer of hard work. The fall programs begin after a brief hiatus upon the completion of the summer program, and many enthusiastic gardeners return to plentiful crops and beautiful blooms just waiting to be enjoyed. Today I’m describing three of my favorite fall activities and their therapeutic benefits: fall planters, mum pumpkins, and harvest herb dip. Students at Christopher School work to transition their school garden from summer to fall. Creating fall planters—either in a personal, tabletop container or raised garden bed—is a great way to prepare your garden for the fall while adding seasonal interest. This activity works well for a group of any size or ability. During this activity, our groups begin to remove overgrown summer crops for composting while replacing them with edible fall crops and autumn blooms. For our off-site therapy gardens, we typically plant cabbage, kale, onions, pansies, and mums. This allows the group one more opportunity to work in their outdoor garden before the impending first frost. This activity brings a cyclical close to the gardening season. In the beginning of spring, we discuss seed germination and the life cycle of a plant. It is important to relate this activity back to the spring to highlight how far the garden has come during the harvest season. The theme and symbolic nature of this activity—events coming to a close or new beginnings—is useful in horticultural therapy groups. Take time to think about how you can relate this to your specific audience and how the message can resonate with them—either as a group or individually. The mum pumpkin activity is always a big hit in horticultural therapy. 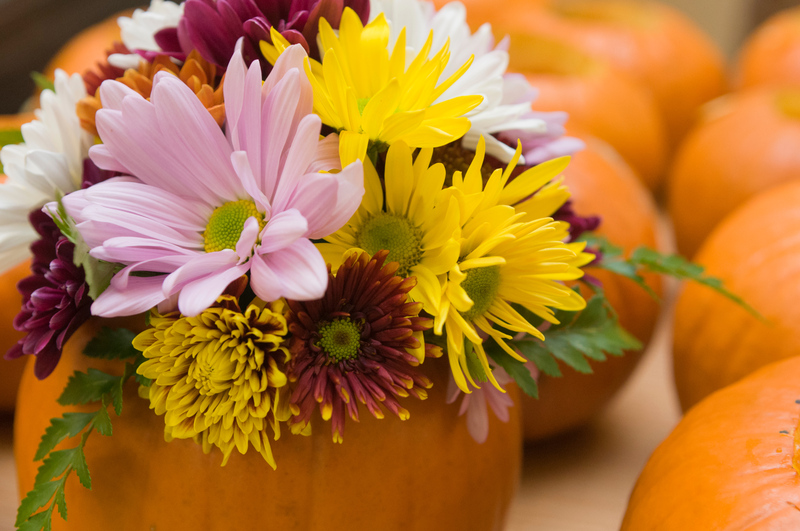 The supplies needed for this activity are as follows: one small pumpkin (I use pie pumpkins), a spoon for scraping, cut flowers, and floral foam. This activity can also be done using soil and cell-pack flowers such as mums or pansies. The mum pumpkin activity has two large components to it: the carving out of the pumpkin and the planting or arranging of the flowers. It typically takes a full 60 minutes for a large group of horticultural therapy participants to complete this activity as well as a decent amount of space. Beautiful mum pumpkins created in an off-site horticultural therapy facility. One of my favorite aspects of this activity is the sheer joy that radiates from our participants after they create a beautiful, seasonal centerpiece. This activity allows participants to create something that is their own, something with their favorite colors, and plant material that will bring them joy every time they see it. It’s important to insert activities such as these to encourage self-expression and promote joy. That, after all, is one of the greatest benefits to gardening. Our simple and delicious harvest herb dip has been a late summer and fall favorite for many, many years. Why is that? It involves a beloved activity for all individuals—eating! For our harvest herb dip, we collect fresh herbs from our garden as well as cucumbers, tomatoes, peppers, and other goodies to create a delicious snack. 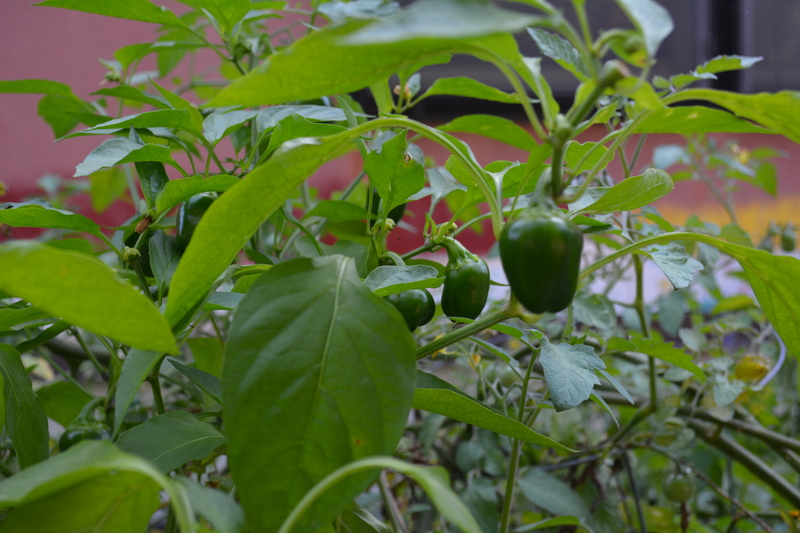 Baby sweet peppers grow in the Christopher School Enabling Garden. With the base of the dip mixed, each participant gets a personal bowl of dip in which they can pour and mix their ingredients. Then, with some sliced cucumbers, peppers and crackers, the participants dig in! 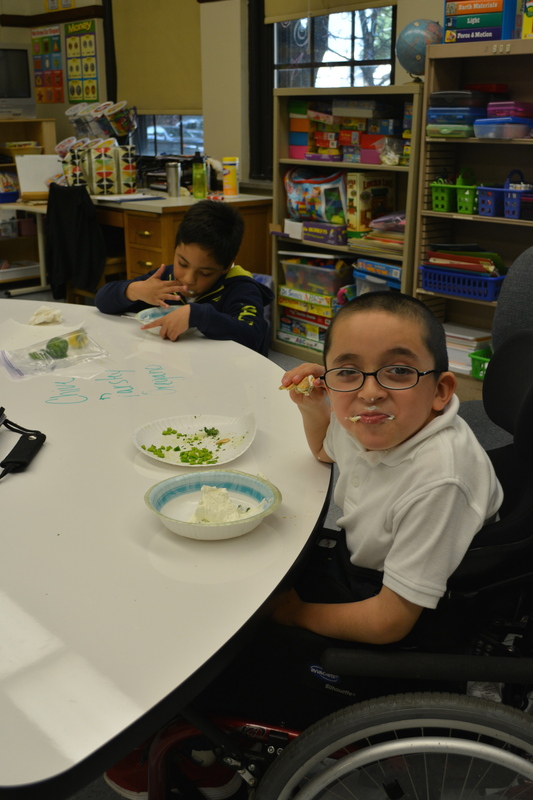 A student enjoys his homemade herb dip with garden cucumbers and peppers for dipping. Inserting activities involving edible garden items is always rewarding. In my first year, I discovered that many horticultural therapy participants (namely students) had never seen a tomato, pepper, or cucumber grow on a plant—let alone one they tended to and cared for themselves. The therapeutic benefits for this activity relate to educational opportunities. We often take time to discuss what other food items can be made from our delicious garden harvest to get participants excited about healthy and sustainable foods. It never ceases to amaze me how much fun students have picking and eating delicious vegetables! There are many more activities that one can do with a group or individual in a therapy garden during the fall season. Simple and inexpensive garden-maintenance activities provide wonderful opportunities for socialization and conversation regarding healthy practices for living things. 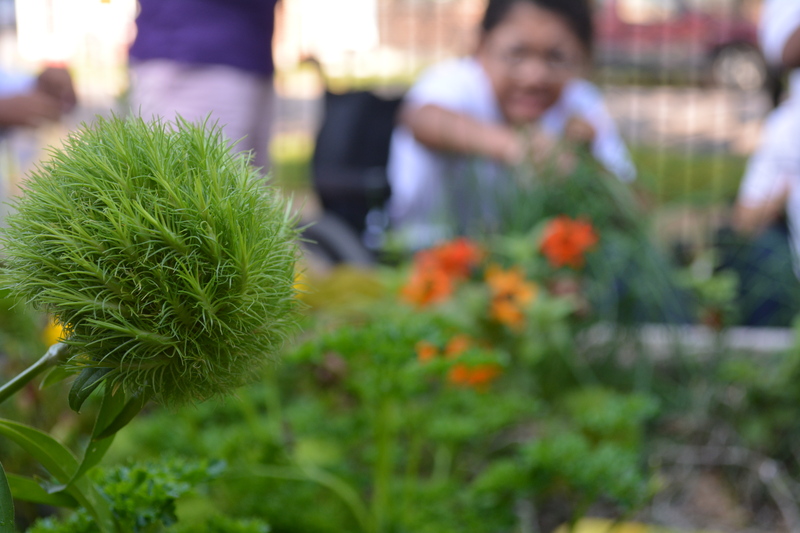 Fall is a beloved season by all of our garden groups, and it’s important to squeeze in as much time as possible in our outdoor therapy gardens before the midwestern winter knocks at our door. With the beautiful fall colors, plentiful harvest, and mildly cool weather—it hard to imagine a more desirable place to be than a garden.